AMMAN — Looting of archaeological sites in Jordan is a widespread problem, yet this time it has brought to light the mosaic floor of a previously undiscovered Byzantine-era church near the Roman city of Jerash. “Underneath about a metre of soil, the mosaic floor of Kanisat Qirmerl was almost perfectly preserved,” Jacques Seigne, director of the French Archaeological Mission at Jerash, told The Jordan Times. The floor, around five by seven metres in size, is in full colour and depicts an unusual scene of men climbing up trees to hide from bears and lions. According to the inscription, which mentions the patron and mosaicist of the floor, the mosaics date back to AD 589-590. 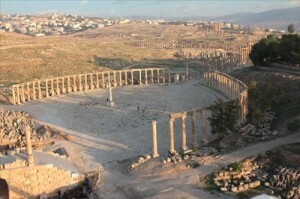 The remains were found outside the ancient city of Jerash, located around 40km north of Amman, on private property, Seigne said. Jerash, known as Gerasa during the Greco-Roman period, reached its greatest size in the 6th century AD as part of the Byzantine Empire. The Department of Antiquities (DoA), under the leadership of its Jerash director, Rafe Harahshah, has just concluded a 45-day rescue operation to uncover and secure the site with the help of Seigne and his team. “Looters were digging in the night and discovered the mosaics by chance,” Harahshah and his colleague Ali Al Owaisi told The Jordan Times. “The next morning one of the looters came to the DoA office in Jerash and told us about it, which is not very common… this meant we could respond quickly,” he noted. Rescue operations such as the one at Kanisat Qirmerl entail securing the site, launching a preliminary excavation and collecting data to be presented to the DoA, Owaisi said. “The problem is the DoA lacks resources, which we need in order to get to a site quickly and protect it adequately,” Harahshah said. “We are mostly dependent on informants for information on looting,” he explained. Although Seigne stressed that no firm historical conclusions could yet be made about this church, he highlighted its historical significance. “The discovery of this church is very important because it may add to the argument that there was no systematic destruction of icons during the Iconoclast period,” he said. The Iconoclast period refers to two periods in the 8th and 9th centuries during which the Byzantine emperors and the Orthodox Church banned religious icons and consequently many religious images were systematically destroyed throughout the Byzantine Empire and beyond. “The excellent conditions in which the mosaics were found in also indicate that the church was used and preserved throughout the Umayyad period,” Seigne said. Later in the Umayyad period, it was transformed into a private house and a wall was built across the mosaic floor which has now been dismantled by the rescue operation, he added. However, now that the rescue operation is finished, decisions need to be made as to the protection and preservation of the site, Harahshah said. “A committee within the DoA will now decide how to proceed; whether to buy the land or perhaps transfer the mosaics to a museum, depending on the available funds,” he added. The Kingdom has thousands of undiscovered sites which are easily accessible, so looting has always been a problem, Seigne said. “But with the explosion of Jordan’s population in the last decades this issue has become much worse,” he explained. “The DoA has to be strengthened to keep up with this development,” the archaeologist added.